I snapped these pictures at WICC in Bridgeport, CT. It is an older PR&E BMXII console, 26 channels, I believe. These were manufactured starting in 1985, I installed one in 1990. It is a testament to their durability that this one has lasted 23 years. They were expensive when purchased, and all of them were purchased directly from PR&E, Carlsbad, California. The beauty of these things is their modularity. 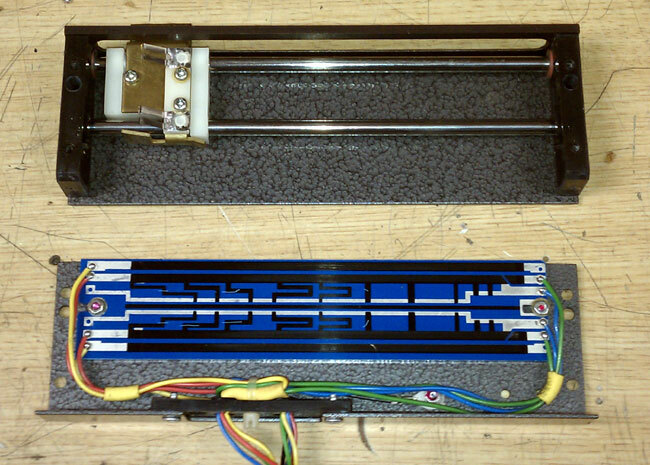 All of the major components are replacable, including the module face inlays. The faders, Penny and Giles 4000 series, are fully rebuildable. The part that wears out the most is the nylon bushings that slide along the metal rails. The contact fingers sometimes also need to be replaced. These are 10 Kohm conductive plastic linear faders. P&G does not make these anymore, they have been replaced by the 8000 series, which has a edge connector instead of a wiring harness. Since the top of the fader is open, it also tends to accumulate dust, dirt and other debris. The fader board itself should be cleaned off with warm water, light soap may be used if needed. Do not use alcohol on these because it eats into the conductive plastic and ruins the fader. One of the great things about this console is the fact that all the modules are hot pluggable. If one needs to be serviced, it can be pulled out of the main frame while the console is on the air and a new module plugged into it’s place. Only the line output module replacement necessitated taking the station off the air, and then only for a few seconds. It was a great concept which is now standard in almost every broadcast console. There were several basic module configurations. On the input side, line level, mic level and telco were standard console inputs. There was also a passive remote line select button set. Out put modules consisted of line level output, control room monitor, and studio monitor modules. PR&E consoles were top of the line gear, but expensive. Most radio stations could not afford them and went with less expensive models like Wheatstone, BE, LPB, Autogram, Radio Systems, etc. The fact that some of these BMXII consoles are approaching 30 years of age and still in service is a testament to their construction. In the early 1990’s, PR&E began branching out into the lower priced market with their product line. They produced the Radiomixer and Productionmixer consoles, however, mid market sized radio stations were slow in adopting them because PR&E had the reputation of being expensive. After all, if you can only afford a Chevrolet, why bother looking at the Mercedes? 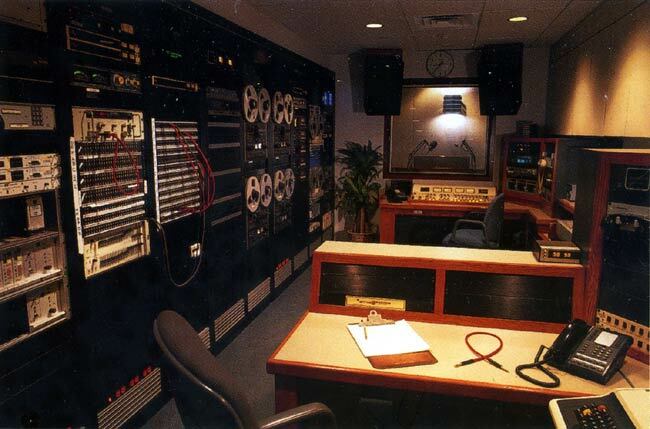 This is a grainy promotions photo from the early 1990’s showing what I think is the WQXR master control room, nick named “The Bridge.” I took a tour there around 1993 or so and it was a fantastic facility, of course the New York Times spared no expense. I really felt like Willie Wonka in the Chocolate factory. Later in that decade, they changed the name to Pacific Research and Engineering, and the went public. I think going public was the death knell, soon thereafter they sold the entire product line to Harris Broadcast. The final non-Harris console was the Airwave, which is a good medium duty modular console, incorporating some of the traditional PR&E designs. The later consoles stopped routing audio directly through the faders, using voltage controlled amplifiers instead. This solved some of the channel drop out problems which sometimes occurred in earlier consoles. The Airwave consoles are much less durable than the BMX series, however, with the advent of voice tracking, perhaps 24/7 durability is not that necessary anymore. Harris has dropped support of much of the early PR&E line, but there are those that soldier on, buying up parts and rebuilding these things. Mooretronix has a good selection of BMX and ABX parts. The WICC/WEBE installation is about to be refurbed, which means these consoles will be headed out the door. There are three of them in fair condition. moved to 2 lafayette street when we combined with WEBE. You might say that board has seen many hours of operation. Ed, I don’t know what the plans are for these consoles. I will ask and see, they may need to continue to depreciate or some such. Although initially expensive, the quality of the material and the technical and mechanical inspection and testing proved that the customer service department of PR&E was an ill used unit. I was very proud to be an employee and delighted in the efforts of the company to see that every product was perfect. Lots of metal, wood and electronics made it’s way to recycling so what went out the door was perfection. A refurbished unit should be the pride of any studio. dunno how I found this link but it was your name and the date that was the eye catcher. I think I may still have a fader or 2 from time I was with PR&E. I’ve nothing to add to this particular PR&E post other than to say hello to Mike ! Hello Mike, very long time ! Is the fader a 4220CU? I think the current replacement part would be the 3000 series (8000 is a more cost effective range). I have a BMX console that has no power supply. Does anyone have info the voltages and connections. Also any info on the audio in/out connections? I don’t know about the previous BMX version… I’d assume it’s the same. I don’t recall the voltages on the BMX II power supply. I will look it up next time I find a manual. I just started helping an owner that has 2 of the BMX consoles. Left channel of the mic audio is low. I’m thinking a poor contact where the board and module meet. Playing with the A/B switch, the On/Off switch, fader or molex connectors don’t help. It’s my first experience with PR&E boards. The molex connectors seem to be a royal Pain in the %^&$. From years of not being touched, they don’t want to be removed. I haven’t figured out the relationship between the input connectors on the rear bottom and the audio input modules. I have discovered that they are NOT sequential. I would REALLY appreciate talking to someone with experience on these boards. I own two BMX-14 consoles, One PSU and a Micromax Card-Player-Recorder which I want to sell. One BMX-14 is in working condition, the other one is complete, but more or less for spareparts. If anyone is interested in pictures etc, just give me a message. I also have a complete manual. ….And that was a GREAT board to operate! Smooth and very forgiving! I had a BMX-14 donated to a high school radio station I oversee but I couldn’t bring myself to cutting the countertop of the studio furniture to install it.I had donated a $5000 Arrakis studio furniture systen in which I replaced the counter during the time I owned it – at $1100 to replace the counter I had serious reservations about cutting a hole to mount a 1978 vintage console. I ended up installing a Gates Stereo Stateman where I was able to use the existing holes in the top. At least if I should be able to acquire a more modern board for them I won’t have to replace the countertop (again) before installing it. What came of the BMX-14 you mentioned? 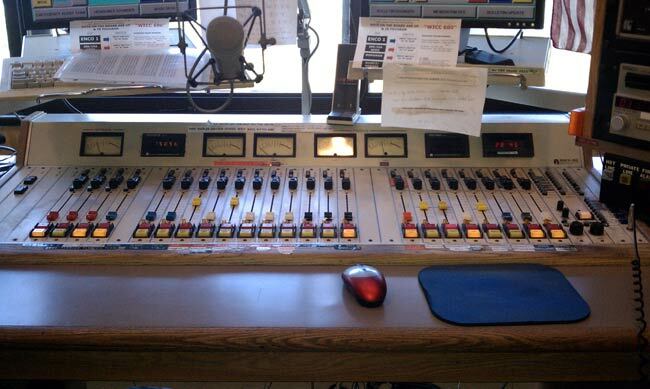 Any interest in selling the console for cash to use for the high school station? My name is Robert Danner. I’m a disabled person with a mild case of cerebral palsy. Robert, I don’t have anything like this myself. You may want to check with some local radio stations and see if they have any old unused equipment they would like to donate. I have a Radiomixer 20 in great condition. Has a lot of extras including a built-in Telephone hybrid and a SAS controller card. I can’t seem to upload a picture here but if there are any interested parties…let me know via email. We are, right now, trying to sell a slew of parts from a working PR&E ABX-26 console. We received the working console and a bunch of other spare parts removed from another console, as a donation. Asheville Free Media was going to put it into service but it is just too large for our studio space. You can find the auction on eBay right now and we are looking for offers. We still have the frame and two power supplies if someone wanted to put it back together, and there are a lot of interesting modules like voice processor, parametric eq, and oscillators. But shipping the frame would be tough for us since we are an all-volunteer run community Internet radio station and just don’t have the resources to ship the frame. I would imagine the channel strips etc. would fit the BMX series too. Please contact at seandennis@ashevillefm.org if interested in the ABX. Looking for furniture for BMX-II 14. Any suggestions? For Sale: Pacific Research and Engineering Production Mixer 28- Send me a email if you’re interested. Cheap. Doe the BMX-II 14 come with built-in mic pre-amps? Chuck, the PRE BMX-II series consoles came with two types of input modules; mic and line. The mic inputs had built in preamps, the line inputs did not. Some people used outboard preamps or mic processors on mic level input modules by using the wiring patch point as the input. Is there an online version of the BMX-III Operations & Technical Manual? I have a fully functional STX-34 Pacific Recorders & Engineering Corporation for sale. Anybody interested or do you know someone that might be interested. We have inherited two PR&E Airwave 20 consoles – donated by KCRW from the old KDB studios in Santa Barbara. They are in pristine appearance and seem to be working. Perfect for a low-budge community radio station! Does anyone know where I can find (or photocopy) a manual??? I installed two BMX I consoles at WCCO-FM, Minneapolis in about 1981. The on air BMX-22 immediately went bonkers and would randomly turn channels on and off. Fortunately Mike Uhl from Pac Rec was here in town that week and when I contacted him he got a whole new BMX I/18 shipped out to us immediately—great customer service. It turned out that they had received a bad batch of 0.1 uF bypass caps, and all the modules were contaminated with the culprits. In about 1999 I inherited a new Pac Rec “Integrity” console that we quickly dubbed the “total lack of Integrity console” that was a nightmare. They had strayed away from the single fader module, and had a bank of 8 faders on one assembly, two in a console, for 16 faders, total. Coca Cola doesn’t care if faders are single or in bunches, and the first liquid spill killed the right hand bank of faders. That console also used a Windows PC for display, and a wireless mouse to control it. When the batteries in the mouse died, the console quit working, too! Again, their great customer service kicked in, and we traded them straight up for a new BMX 3/18. Were those the square-ish blue caps? Those things killed a lot of equipment. AudiCord among others had a service bulletin to replace them all about that time as well. KYYA 93.3 FM Billings, MT. We purchased a BMX II 22 around 1980. It’s the best console I ever used. In about 1988 we ordered another BMX II 22 for our main production room. BMX is the Cadillac! I have several completely restored Pacific Recorders & Engineering BMX-III consoles available for purchase. I Have a BMX-III-22 with 2 MIC modules and 18 LINE modules WITH Slate and 2 buss SEND amplifiers and a BMX-III-26 LOADED.They are blanket wrapped in air conditioned storage in Daytona Beach Florida. I currently have three other Pacific Recorders restorations going on right now including a very rare STX-34 Television Network console. This will be available for purchase when the restoration is complete. These consoles are a joy to repair, maintain and to operate. Very interesting reading these posts. I was working as an announcer in the 70’s and 80s. My experience with the BMX consoles was at KYTE AM & FM (Gaylor). The station call letters changed many times over the years as did the owners. We had four BMX consoles (I was told $40K each) with 1 in each broadcast studio and 1 in each of the 2 production studios. We had 2 of the smaller consoles in the news booths. Also one in the news production room. This in Portland Oregon in 1979. Of all the radio stations I worked for prior to this and after I never again had the experience I enjoyed of working with the BMX consoles. As I recall one of our engineers went to work for the BMX folks. This owuld have been 1979-80. Hi Cliff, I was an engineer at KYTE-AM and KLLB-FM 1980-81. I too was impressed with the PR&E products. The air studios and production rooms had the gigantic Model 1’s. A few years ago I was surprised to learn the former KYTE air console was still being used! Just purchased 2 BMX III 26 consoles for small market fm station in Ely Nv. Looking all over cyberspace for the manual on these super tanks. Any one have site I can go to for some tech salvation?? I have a BMX11 manual in a pdf file format and can send you an access to view on Google Docs. A few of the pages didn’t replicate when Staples ws copying the manual to a digital file, but there is still some useful info. Thanks D. , signed up on virtual engineer. One of the guys did a great job helping me configure and prepping for install at station. Works great !! Would you happen to know the value of this mixer and where I could sale it? Will you please send me the BMX II pdf manual for this mixing desk please? I bought a second hand desk and need the manual. I need the pdf manual for the BMX II mixing desk please? I think this guy wants a manual for a BMX II console, but it is hard to tell. I am looking for a BMX II or III for a non profit NPR station in Columbus Ohio, WCBE. Thanks to all and a great read about some great consoles! The BMX was the last analog console that PR&E made. I worked for them just after they were bought by Harris Corporation and helped design the NQX and RMX digital consoles. The company is now owned by Gates Air. I hope that helps.